Magellan's Return to Route solution will ensure all bins are collected, blocked streets are reported, and drivers are locked on route, ensuring 100% completion. By eliminating paper routes with Return to Route, drivers are more focused on the road, increasing the safety of drivers and the general public. However, when drivers miss a stop, they are automatically routed back to the point of deviation, reducing complaints and overtime costs. Reduce costs and boost efficiency with Magellan. Route Planning. Management. Execution. Monitoring. Most products focus on optimization, but that's only a piece of an effective route management system. RTR focuses on what other companies don't: route planning, management, execution, and monitoring. 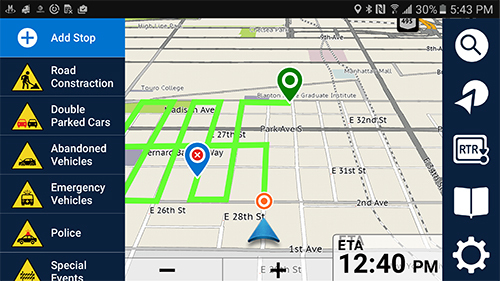 Take route planning to the next level and into your hands. This critical step allows managers to spend more time planning routes, which can lead to increased safety and fuel savings while decreasing maintenance and other costs later on by creating, editing, releasing, scheduling, and assigning routes instantly from the backend web portal. Effective route management means having real-time insights and being able to take action instantly. Fleet managers can better manage time, fuel, and other costs by managing their routes, drivers, assignments, and obstacles while monitoring vehicle locations, route completion rates, road obstructions, tasks, and more. Route execution is more than just completing a route; it's completing a route safely and efficiently. Not only can effective route execution reduce operational costs while improving service, but it ensure improved safety for drivers and citizens alike. Drivers will be locked on route ensuring optimal route completion with an in-cab naviagtion solutions that will navigate them around obstacles, ensuring they never miss a stop.